Here is a selection of what we have available. We also have dessert canapés for those with a sweet tooth. 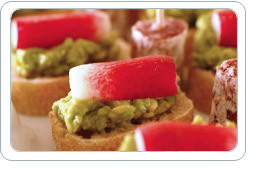 Price per person £3.45 each person will need three canapés. Breaded and filo prawns. Served warm with a lemon mayo dip. Herby scones topped with salmon and horseradish cream. Super sticky sausages served warm. Smoked haddock fishcakes served with tartar sauce. Lemon and garlic chicken skewers. Crispy duck pancake rolls filled with crunchy cucumber and onion and served with hoi sin dipping bowl. Brussels pate and onion marmalade crostinis. Filo tartlets filled with spice coriander prawns. Croustades filed with poached salmon and dill mayo. Croustades filled with prawn cocktails. Crispy potato skins served with a sour cream and chive dip. Mini cherry tomato and basil pesto galettes. Aubergine and pine nut pizzete. Baby baked potato’s stuffed with a creamy mushroom sauce. Vegetable spring rolls served warm with a sweet chilli dip. Herb short bread topped with goats cheese and chutney. Filo tartlets filled with tomato concasse, crème fraiche and chives. Focaccine farcite with blue cheese and rocket. Wild rice and spring onion pancakes with avocado lime salsa. Fennel marinated feta and olive skewers. Celery barquettes with stilton and walnuts.